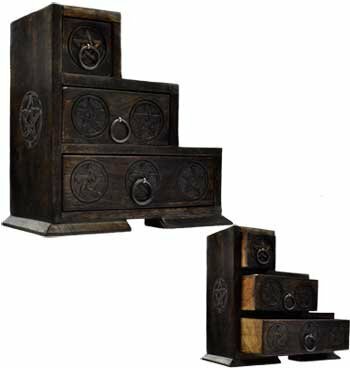 This chest and cupboard piece is a beautiful addition to any altar, providing much needed storage spac FULLY STOCKED with everything you need for 3 different types of spell work, including Mama Em's tried and true spells for you to follow! 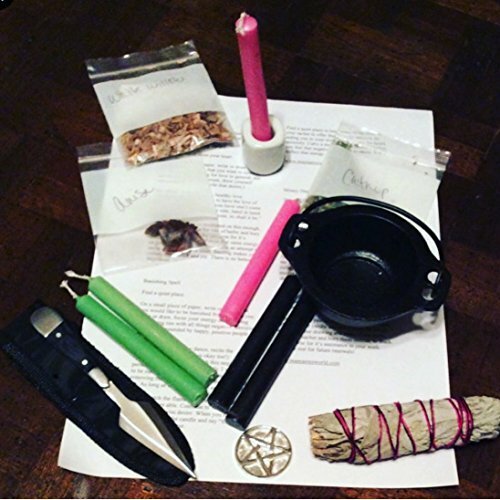 Included: Cast iron cauldron, sage smudge stick, altar coin, 6 chime candles with holder, 3 bags of herbs, altar coin, and 3 custom spells. What you get: 1 chime candle holder 1 mini cast iron cauldron 1 pentagram altar coin 1 small white sage smudge stick Complete Money drawing spell kit: 2 green chime candles, 1 bag of money drawing herbs, instruction spell sheet Complete Love-drawing spell kit: 2 pink chime candles, 1 bag of love enhancing herbs, instruction spell sheet Complete Banishing spell kit: 2 black chime candles, 1 bag of banishing herbs, instruction spell sheet Athame (ritual knife) The best part is, EVERYTHING fits inside the chest. So once you've completed your work, it all packs up nicely and can be stored away if you need to keep it out of sight!